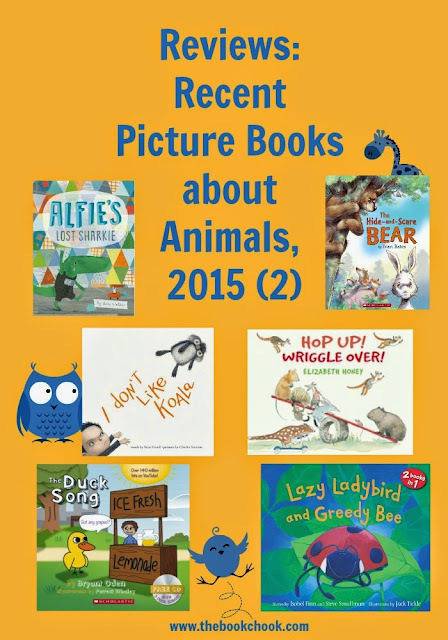 Some of these books are about real animals; others are about toy animals. All have the potential to delight a child near you! The Duck Song (with CD): Does your family refer to this phenomenon as ear worm - when a tune or song is stuck in your head? If there’s one song that is guaranteed to give you ear worm, it’s The Duck Song. It’s incredibly catchy and kids love it. Now Bryant Oden and Forrest Waley have collaborated to create a children’s picture book based on the song. It’s been published by Scholastic (2014) and comes complete with CD of 3 Duck Songs. RRP: $Au16.99. The song is a repetitive narrative that is very simple and that kids will love about a duck that keeps approaching a guy at a lemonade stand to ask for grapes. Not convinced? Trust me, it’s funny. You can hear the song on Youtube where it’s had around 190 million hits. Picture books of songs are really useful to beginning readers because they encourage kids to sing along with the words. Children memorise the lyrics like this and think they are “reading” - this is an important stage in pre-reading. The illustrations are bright, colourful and childlike. Hop Up, Wriggle Over: Here’s a fun romp of a picture book for the very young. Written and illustrated by Elizabeth Honey, it was published by Allen and Unwin (2015.) RRP: $Au 19.99. It’s a celebration not only of Australian animals, but of visual and linguistic play. We encounter young Aussie animals playing together just like kids do - and while there are lots of Whoopees, there are also Whoops-a-daisies that kids will ruefully relate to. The text may be minimal, but each word has been carefully chosen. There are onomatopoeic noises and words just for fun, the whole accompanied by lovely watercolour artwork. Alfie’s Lost Sharkie: We met Alfie in Hurry Up, Alfie, and here’s a new children’s picture book about him. Alfie’s Lost Sharkie was written and illustrated by Anna Walker, and published by Scholastic Press (2015.) RRP: $19.99. I laughed aloud several times when I read this book to myself. My guess is that Alfie is around 3, and Walker knows kids this age so well. We see the tunnel vision, when Alfie must find Sharkie right on bedtime. We see the liberal interpretation of “choose a toy for bed” when young Alfie subsequently staggers in under a load of toys. Despite Mum’s best efforts at distraction and gentle guidance, Alfie is determined to find Sharkie. And then he loses Bunny… I can’t wait to read this book to my Library Storytime group where I predict the toddlers will be caught up in the drama, but the four-year-olds will laugh along with the parents at Alfie’s antics. I Don’t Like Koala: Here’s a most unusual children’s picture book. I Don’t Like Koala was written by Sean Ferrell, illustrated by Charles Santoso and published by Koala Books for Scholastic (2015.) RRP: $24.99. If you’re looking for something cute and sweet, this book is not for you. It definitely has a dark side, yet it’s one I can see some kids absolutely relishing. It’s probably not a book I would recommend to children of delicate sensibilities. I loved it and think Ferrell has spun a tale many children will understand, that of an eerie “thing” that takes on a life of its own. Koala is the most terrible terrible. His eyes follow Adam everywhere he goes. The image of Koala on this page is slightly manic - with one wandering eye and frantic fur - and kids will understand Adam’s efforts to get rid of the toy. Despite his best efforts, Koala is always there, staring. Tension builds and Koala takes on an almost supernatural aura. Santoso has greatly contributed to the story with his unusual perspectives and very talented illustrations. I won’t be reading this to my Library Storytime group, because I think they’re too young for it, but how I wish I could share it with older kids! Its a wonderful resource for discussion about appearances, adult/child communication, and fears. Lazy Ladybird and Greedy Bee: This is actually two separate stories in the one book. The Very Lazy Ladybird was written by Isobel Finn and illustrated by Jack Tickle, and The Very Greedy Bee was written by Steve Smallman and illustrated by Jack Tickle. The book was published by Koala Books (2015. ) With the RRP of $16.99, it represents good value for money. Young kids love to predict what’s going to happen next. The Very Lazy Ladybird capitalises on this with a large part of the story being repeated text as the ladybird tries and rejects different places to sleep. There’s a surprise ending kids will enjoy. The Very Greedy Bee exhibits behaviour most kids will be familiar with when he refuses to share. Luckily he learns a lesson by realising that others have kindly helped him. Tickle’s energetic and colourful illustrations unite the two stories within one cover. The Hide and Scare Bear: This rhyming children’s picture book was written and illustrated by Ivan Bates and published by Koala Books for Scholastic (2015.) RRP: $14.99. I think kids will enjoy this tale of a bear who has not yet picked up the social skills he needs. liked playing a game called Hide and Scare. jump out with a ROAR from behind a tree. Perhaps children know someone human who likes to be loud and scare people out of their wits? When the other animals decide action must be taken, Rabbit wants to show Bear the kind way to play.